I.F. Stone was the Washington correspondent for P.M. P.M., which stood for “Picture Magazine,” was published in New York by Ralph Ingersoll from June 1940 to June 22, 1948, with funding from Marshall Field III. Although, a magazine of the left, it often clashed with the Communist Party organ, The Daily Worker. P.M. accepted no advertising to be free of commercial pressures but this made survival difficult. Its circulation averaged 165,000 but needed 225,000 copies to break even. The day after it closed, it was reorganized as “The New York Star” which closed on January 28, 1949. 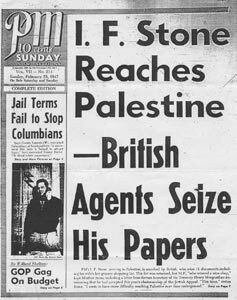 Chapter 13 of “All Governments Lie” provides background on Stone’s work at P.M.